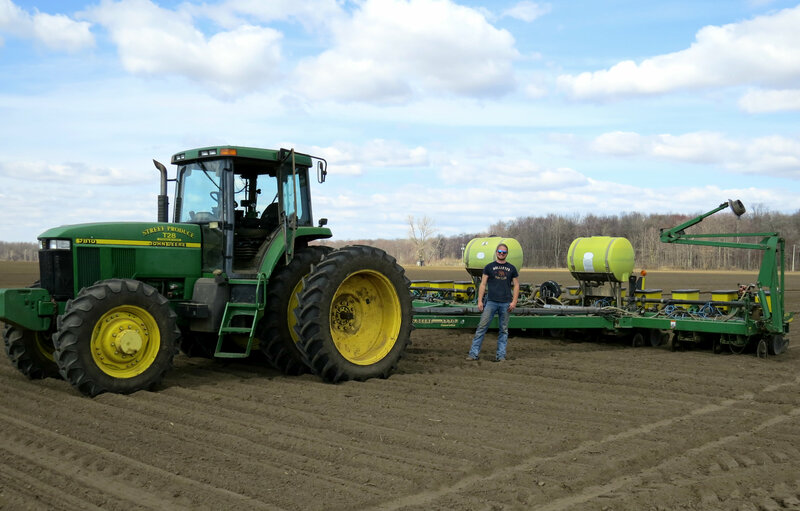 A photo of Nathan Streef from 2015’s planting season. Courtesy of: Mikayla Streef. With a title like A Quarter Young, it’s no surprise that this blog has profiled a great deal of 20-somethings that have tackled everything from music, art, fashion, and business. Young entrepreneurship is alive and well in Ontario, and being a quarter young seems to only make it that much more impressive. Looking outside of the urban centre, it doesn’t take long to find that same work ethic is thriving in the fields that grow our food. You need only look so far as your dinner plate. This past spring, during plant ’15, I had the privilege of catching up with Nathan Streef, a 24-year-old farmer just outside of Woodstock, Ontario. The Streef family has been farming for 40 years, with the family operation now exceeding 2,600 acres of produce you can find in your grocery store. In the 21st century, farming has had to cope with an influx of engaged consumers. The result is seeing farms changing and adjusting their practices based on consumer needs. Outside of transparency, farming operations have a real need to be innovative to meet the rising costs of production, fulfil market demands, and yet still be profitable. For Nathan, the beginning of his education started at the family farm. After completing his two-year agricultural diploma at the University of Guelph’s Kemptville Campus, Nathan returned home to the family farm eager to begin his career. A typical day for Nathan changes depending on the day or the season. If there is anything Nathan wished he could impart on the consumer is to know how their food got to their plate. To learn more about how to access just what Ontario has to offer, visit www.ontario.ca/foodland/foodland-ontario. To learn more about how food gets from farm to table, check out #Farm365 or #FarmFactFriday in partnership with Streef’s Produce and Ontario Fruit and Vegetable Growers’ Association (OFVGA).